The Legendary Starfy developers talk about their upcoming DS platformer. We were fortunate enough to be invited to take part in a teleconference with several developers of the upcoming DS title The Legendary Starfy today. While there was a Q & A session, it turned out to only be yours truly and one other guy who fired one question and then disappeared. Of course that left the majority of the questions for me, so I guess I shouldn't complain much. You can check out the names and positions of the Legendary Starfy development teams who participated in the teleconference below, as well as the full contents of the session. As the teleconference kicked off, there was a brief introduction of the Starfy character and games by Kazuki Yoshihara, Director of The Legendary Starfy. Kzauki Yoshihara: The Legendary Starfy is actually the fifth game in the series, but is the first Starfy game to be released in America. The story of the game is very easy to understand and very comical, so it will be easy for gamers of all ages to appreciate it. The story of the game itself centers on a mysterious stranger who falls on Starfy while being pursued by several bad guys, for lack of a better word. Starfy ends up helping the stranger locate his lost memory and that begins the adventure. Nintendo Life: Why has it taken so long to bring the Starfy series to America? 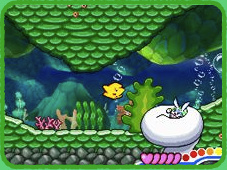 The Starfy series actually began on the Game Boy Advance system and has been around in Japan for quite some time. But the developers were making the games under the thought that the games would only be for the Japanese gaming audience. The developers knew it would be well received by Japanese gamers, but were unsure how it would be accepted by an American gaming audience. The fourth game, Densetsu no Stafi 4 on the DS, was a big hit in Japan, so when development of the fifth game began, for the first time the development team began thinking about how to bring Starfy to gamers all around the world and not just Japan. They created this fifth game with that in mind. Because the DS had become such a worldwide phenomenon, it was just the perfect opportunity to try and bring Starfy, along with that momentum, to the rest of the world. So this was really the first opportunity to sit back and think about what we could do with the series and the story line to figure out what to tweak in order to make it easily accessible to a worldwide market. Chris Ferreira: If this game proves to be a success in the states and elsewhere, is there a chance that the other four [Starfy] games might be released outside of Japan, maybe through a service like DSiWare? Hitoshi Yamagami: Right now the development team has no intention of releasing them at this time, however if Starfy does indeed prove to be a huge hit and fans demand that they have the first four [Starfy] games, then that possibility certainly exists. Nintendo Life: Were there a lot of changes, as far as the graphics or story line, in localizing this game for America? 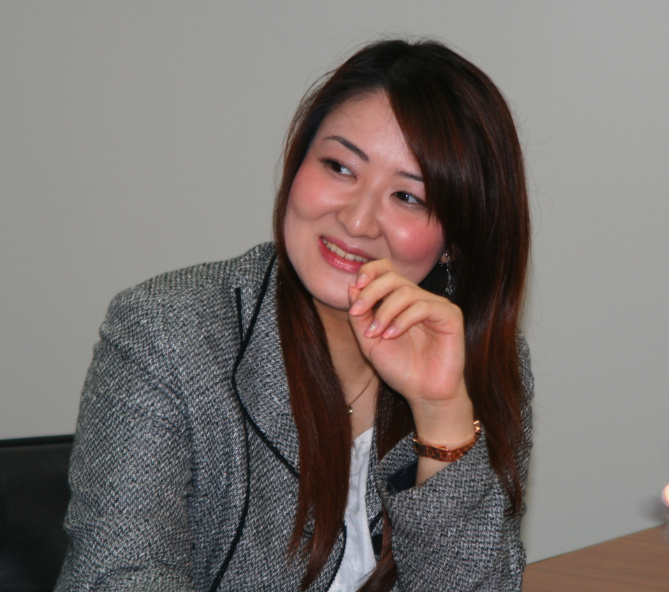 Miki Fujii: The games were made with children as the target audience, so they were made with things little children enjoy, like an emotional story that wraps up at the end without anything that's too difficult to understand. Yurie Hattori: That's the reason we didn't feel that too many changes were necessary with this version when we brought it over to America. 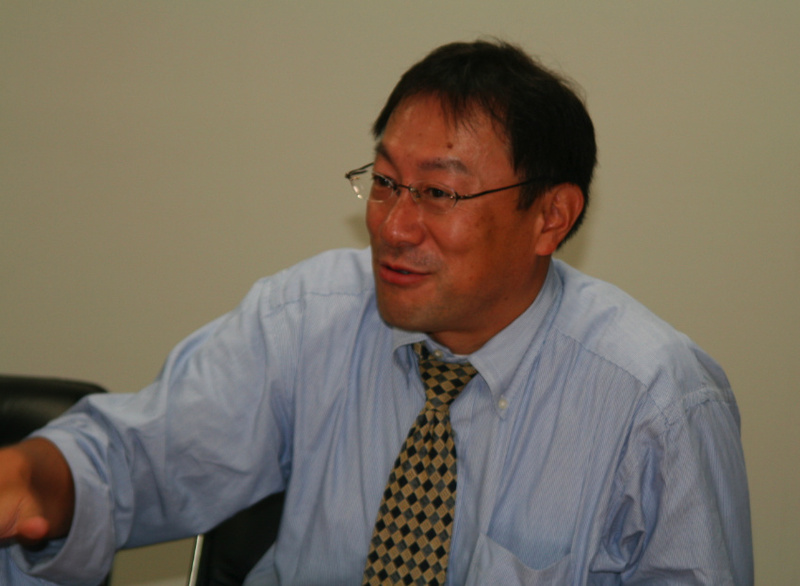 Kazuki Yoshihara: We were kind of worried about the character Moe. 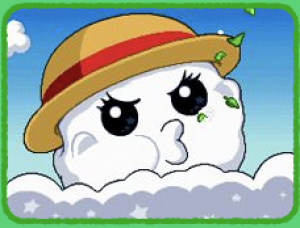 We thought he might be a little too Japanese in his style, but during localization we thought he was pretty much okay as he was and there wasn't going to be any significant changes needed. Miki Fujii: The major changes in the graphics were in the Manga portions of the game. Japan has a huge Manga culture and the original game was made with that in mind. But when we brought it over to America we had to change a number of things in the comic parts of the game so they would read from left to right instead of right to left as in the Japanese version of the game. But the game still retains all of the colorful charm of the original. Nintendo Life: Are there any plans for a sixth Starfy title in the works? Moderator: How did the team come up with this character of Starfy that looks like a Star, but has most of his adventures underwater? Hitoshi Yamagami We've [Hitoshi Yamagami & Yasuhiro Minamimoto] been working together for over 15 years. In November of 1995 I received a directive from my boss asking if I could come up with a kind of floaty platformer and I was told to make it. After about six months of working on this idea of a floating character being pushed through this maze we decided we weren't getting anywhere and that this was not really interesting. I asked if we could please take control of this floating character as opposed to just pushing it around? As long as things were floating around we felt like the idea of a water-based character would be good. After talking to Mr. Minamimoto, we decided this would be a good idea. We thought as far as a character that would fit that environment, maybe a jellyfish or starfish would be a good character. We also changed direction on the project a bit and it was then that the project went through a period of trouble and it wasn't until March 1998 that the project began to come to fruition. Of course in 1998 we were going through the process of changing over from the Game Boy to the Game Boy Color, so orders came down that they wanted us to sort of revamp this prototype of the series to work on Game Boy Color. Then we had to go through and do that work. Then in 1999, as we were approaching the release of the game, we were told by the company that the Game Boy Advance would soon be released and that we would no longer be making any Game Boy Color software. So we went through another period of reflection and began rethinking the game yet again. 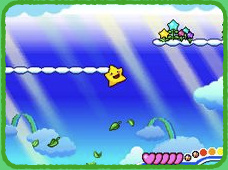 Starfy was originally a starfish, but during the time of development he went through changes to where he came down out of the sky, so one of the questions that Mr. Yamagami is often asked is, "Is Starfy a starfish or a star?" and the company policy is to respond that he is neither. 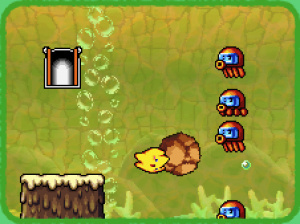 Nintendo Life: The Starfy games have always used a unique combination of platforming and puzzle solving elements. Was there a conscious decision to include puzle solving elements in with the standard platforming game play? Kazuki Yoshihara: The biggest difference between Starfy and other platformers is that Starfy is set in the ocean. 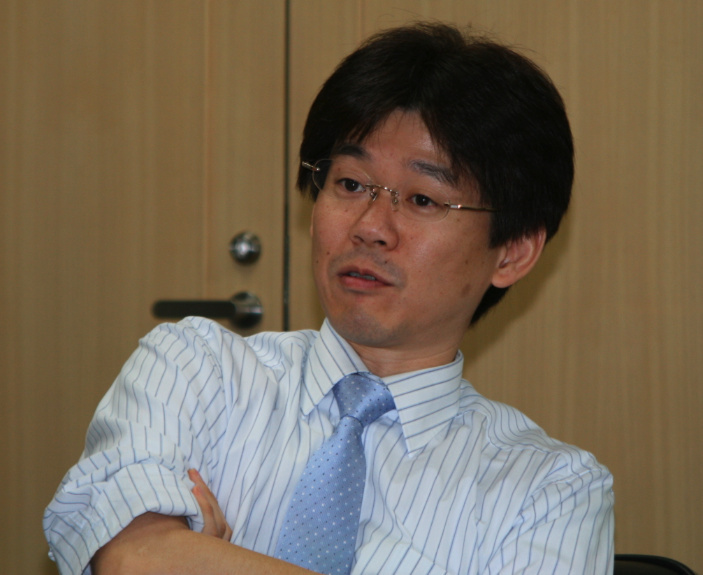 Yasuhiro Minamimoto: The fact that the Starfy games are set in the ocean means you can move freely, both left, right, up, and down, as you make your way through the game, a huge difference between other platformers. The ocean lets you move all the way around without any type of gravity holding you down, and that's what makes Starfy stand out. ** I also enquired about the possibility of the Starfy series ever coming to the Wii console and the developers were quick to say that they didn't know how well the swimming mechanics of the game would translate into a 3-D title on the home console. They basically said the game has just always felt at home in the 2-D world of the portables and that was likely where they would stay. 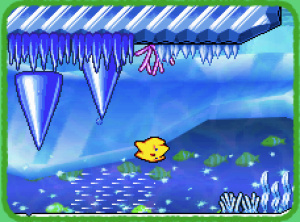 Moderator: How do the older games in the series, those we didn't see in North America, compare to The Legendary Starfy on DS? Were there any new game play mechanics that were introduced for this new game that we should mention? Yurie Hattori: Basically when we started working on Densetsu no Stafi 5 we wanted to bring the game out to even people who had never played the other Stafi games and could pick it up and have fun with it without having played games 1-4. It was the perfect time also to bring the game to America because it would be a game that would be the result of all the experiences that we had gained through making games 1-4 with the combination of all the great ideas we'd had. 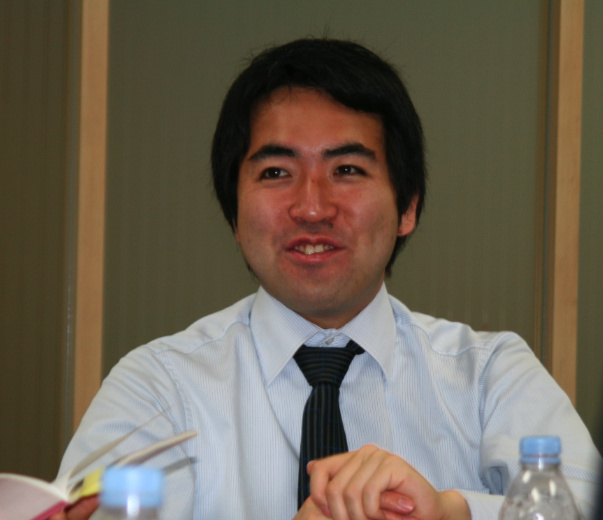 Hitoshi Yamagami We're very proud of this game because the action and puzzle aspects of the game have now reached a very high level of refinement in the game. That's why we're so excited for gamers in America to experience the game, because we feel it's the best game so far. Kazuki Yoshihara: Not only have the mechanics become more refined, but Starfy has also matured as well with respect to how he was in Starfy 1. The main character was kind of a crybaby in the first game and now he's a bit more grown up in the way he helps out the other characters in the game. Overall it was a fun teleconference that offered some good insight into not only the new upcoming The Legendary Starfy game, but also a bit of history into the series itself. Nintendo has promised to send us some new Legendary Starfy goodies tomorrow, so hopefully we'll have some new artwork and screenshots to put up in preparation for the release of the Nintendo DS game on June 9th. We can hardly wait. I think they will eventually. At least I hope they do. While a 3d Starfy may not work, wouldn't a WiiWare one be great? You should ask them about that if you're still in contact with them, Corbie. Also, Minamioto is the coolest name. I want it so I can call everyone factoring hectopascals! Me too, but it doesn't matter too much because I guarantee if it doesn't Game Traders will be selling import copies, or I could always get it off the net. I was going to ask specifically about WiiWare, but they ran out of time. I might submit the question to them via email and see if I can get an answer. I'd love to see a 2-D game on WiiWare. What a fantastic interview! Good work Corbie! Next up, Miyamoto himself! Wow, and IGN's already stolen the info you got Corbie! @Damo: Get it organised already! Just wondering: why was that one section about a Wii version written as a summary instead of Q&A like the rest of the section? Would they not let you record that section? Is the entire world forgetting that 2D games CAN be released on Wii at retail? That Wario Land: Shake It! even EXISTS? I don't see a problem with them going that route if they wanted to. But first thing's first: I need to get this game and see if it's REALLY that good. THEN I can demand the rest of the series, as I don't believe in such a thing as a game that's "too Japanese." After all, I'm a Goemon fan! @ Objection_Blaster - Static was on the line and I couldn't decipher who said what during that part so rather than misquote someone, I just summarized it. 2D retail games work better on DS. Really good interview Corbie! Thanks for providing us with all this info about Starfy! I'm even more psyched for this game now than ever before!